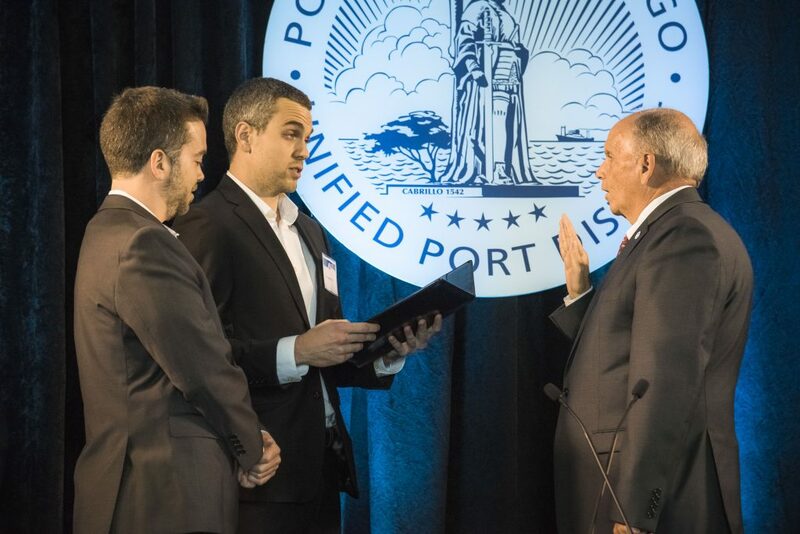 Garry Bonelli is sworn in as new Board Chairman of the San Diego Unified Port District by his sons Jeff and Jake. 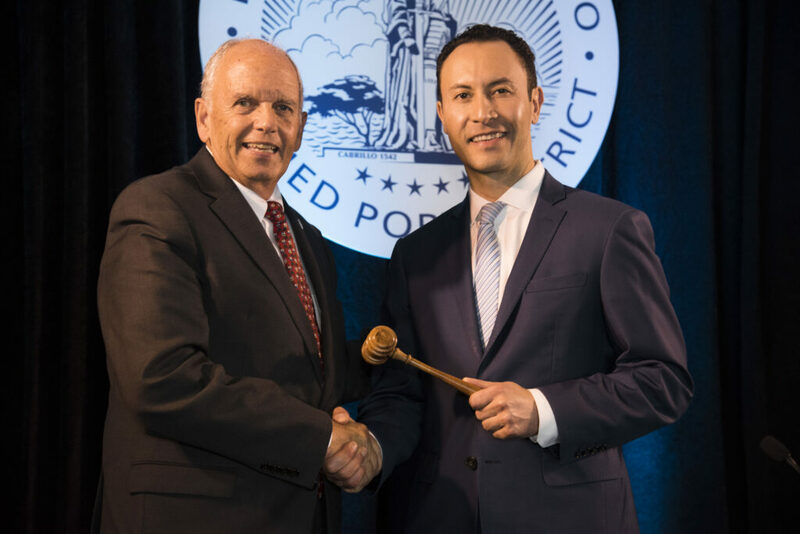 As of this past week, longtime Coronado resident Garry Bonelli is the new board chairman of the Board of Port Commissioners for the San Diego Unified Port District. Bonelli fondly remembers taking the ferry across the bay from downtown San Diego to Coronado back in 1968 when there was no bridge nor Coronado Shores. As Coronado’s representative on the San Diego Port Commission, Bonelli had a most unlikely journey to get here. While living in the Bronx as a young man, he had two neighbor buddies drafted and subsequently killed in Vietnam. At the time, he was failing his college accounting classes and it looked like he would be drafted into the Army. His father recommended enlisting in the Navy or Air Force to lessen the chances he would end up serving in ground combat. Bonelli joined the Navy and attended recruit training at the Great Lakes Naval Training Center in Chicago. Retiring after 45 years as a Navy SEAL, with 13 on active duty and 32 SEAL reserve years of service, including a stint as the CO of Seal Team Five, he rose to the rank of Rear Admiral, earning his M.S. in mass communications as well as undergraduate degrees in journalism and marketing. The Navy also sent him to UNC Chapel Hill to earn a certificate in business leadership. In 2013, the City of Coronado was seeking a resident to serve on the board of Port commissioners. 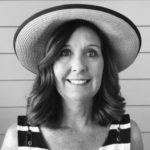 With the encouragement of friends and city leaders, Bonelli was selected by the council to be Coronado’s representative on the San Diego Port Commission. Five years later, he says “I am still learning and making discoveries about how diversified our port truly is.” The Port of San Diego has seven Commissioners, three from San Diego due to its size, and one each from the other represented cities: Coronado, Chula Vista, Imperial Beach, and National City. Port Commissioners are appointed for four-year terms and can be reappointed, with the Chairman elected by board colleagues on an annual basis. Chairman Bonelli was sworn in on January 16, 2019, at a ceremony at Coasterra restaurant on Harbor Island. As the newly appointed Chairman, his stated theme is “Renaissance on the Bay.” “Often people don’t realize the impact the Port has on the regional economy,“ he comments. As a Port Commissioner, he makes public policy and provides stewardship for the 6,000 acres of tidelands along 34 miles of San Diego Bay. An economic engine for the region, the Port generates $8.3 billion annually and supports 68,000 well-paying jobs. Commissioner Bonelli coordinates with the Port’s five member cities, works with the shipbuilding and ship repair industries, oversees operations of cargo and cruise terminals, and establishes policies for harbor police and homeland security issues. His responsibilities include working with the U.S. Navy and Coast Guard, environmental groups; and more than 800 hotel, retail, restaurant, and visitor serving tenants who lease tidelands. The Port is also currently working with the current leasee of the Coronado Cays North Grand Caribe Isle property with the goal of beautification and to create more open space. Stayed tuned for progress on this over the coming months. The life of a Port Commissioner is full of planning and meetings, generally at least 10-15 hours per week and this number doubles on weeks before the monthly Board Meetings. As Chairman, his load is even greater, as he sits on more than half a dozen boards, including the SANDAG Airport Connectivity Subcommittee to help improve ground mobility to and from San Diego International Airport/Lindbergh Field as well as a military base access committee to determine better solutions to move people on and off bases around the region more efficiently, and the SANDAG Transportation Committee, which oversees a myriad of issues including the Bayshore Bikeway. His wife, Marti, adamantly tells him that he has miserably failed at retirement by keeping busier than ever; however, he cherishes his role in making a difference as a Port Commissioner. He feels blessed to live in the Crown City, where he and Marti raised their two sons, Jeff and Jake, both of whom still live in San Diego. Portside Pier, in the former Anthony’s Fish Grotto site on Harbor Drive, is expected to open this time next year, with four new restaurants, including Brigantine on the Bay, Miguel’s Cocina, Ketch Grill and Taps, and Portside Gelato and Coffee. The Convention Center expansion discussion will continue. For the first phase, the Port had funds to help underwrite the project, and were also able to help with the second expansion. Now, additional funds are needed for the next expansion phase and increasing the Transient Occupancy Tax (TOT) has been proposed by the City of San Diego. That decision will have to go to the voters who reside in the City of San Diego in 2020. Since the Great Recession of 2008, the passenger cruise industry is making a resurgence. For each and every cruise that starts or ends in San Diego, the impact is up to $2 million to the local economy when a cruise starts or ends in port here, and $330,000 when a stop in port is part of the itinerary. In response to a growing economy and great strides taken by Mexico to update their ports of call, the cruise industry is once again starting to grow in San Diego, with 250,000 passengers last year and an anticipated 400,000 this year, with the growth anticipated to return to previous numbers within three to five years with Disney, Holland, and Carnival Cruises all using San Diego as a port. “We were one of the first Ports in the nation to adopt a Climate Action Plan, and little things go a long way in making a difference in the environment, like having plugs where ships can secure power and not keep their engines running. We have a great team of people taking on the different challenges that arise,” he says. One of his recent duties was to reopen the Shelter Island Boat Ramp, which has been closed for more than a year for repairs. The delay was due to unexpected cement blocks and debris that were discovered and had to be excavated. As the busiest boat ramp in California, with approximately 50,000 boaters a year, this has had a major impact on the three other boat ramps, including Glorietta Bay Ramp in Coronado, and Chula Vista and National City’s. The reopening and upgrades to the Shelter Island Ramp will have a positive effect for the region immediately. One of Bonelli’s personal passions is serving as the chairman of the Navy SEAL Foundation Board. He travels extensively to raise donations to fund more than 30 programs, including assistance for Gold Star families, scholarships, and bringing world health experts to work on PTSD brain protocols, advanced prosthetics and many other groundbreaking projects to assist SEALs and their families. 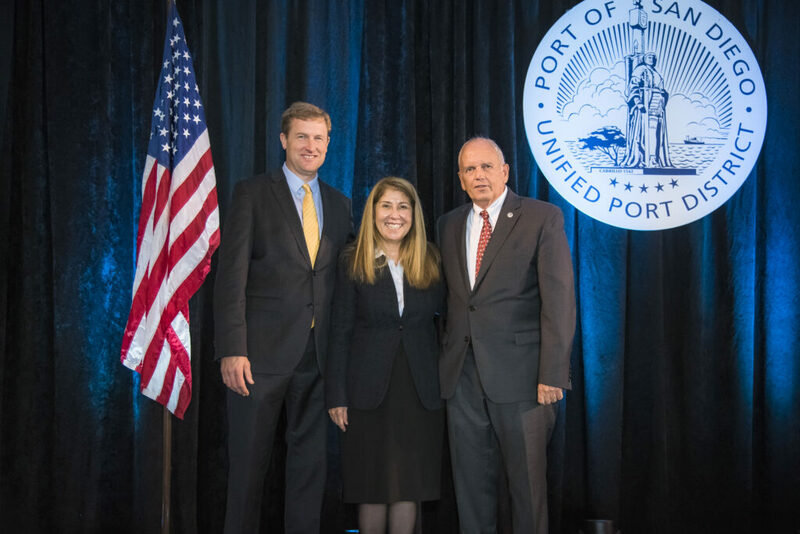 Michael Zucchet, Port Secretary, and Ann Moore, Port Vice Chairman, with new Port Board Chairman Garry Bonelli.